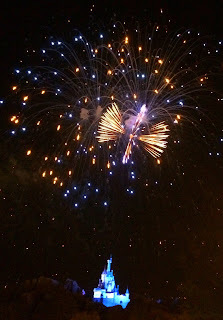 My favorite spot to watch Wishes in the Magic Kingdom is actually in the area of New Fantasyland. The crowds are low and the view over Beast's Castle is spectacular. The fireworks are also quite a bit louder in that area. I took this shot last weekend during the Blue Fairy sequence of the show.